MISSILE COMMAND, South Bank, Monday (NTN) — A new generation of sophisticated “cyber terrorists” are to be blamed for the imminent failure of the London 2012 Olympics. Although the Coalition’s National Security Strategy identifies climate change, population growth, the rise of al-Qaeda and the return of Northern Ireland-based terrorism as significant problems, the document focuses on the most important threat to Britain: attacks on the economic interests of Conservative party backers. 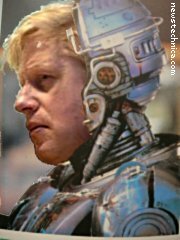 The terrorists, hypothesised to be Internet fundamentalists devoted to copying MP3s, deriding software patents, editing Wikipedia and turning British athletic prowess into nanotechnological dust, will use artificial intelligence to hack into the ZX Spectrum that runs Boris Johnson and replace him with a slightly larger shell script. The 8% cut in the defence budget will be patched with an additional £500m of spending on “all things ‘cyber,'” focused on the very finest snake oil that the party’s very dearest friends can sell.